"Andrew is an extremely creative individual, and is always spontaneous, especially in live performances. His shows feature anything from traditional Indian 'standards,' or ragas, to hard driving 'thrash-grass.' 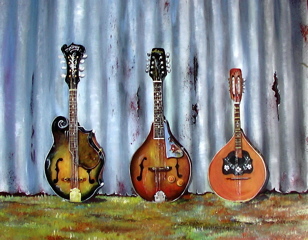 On his latest album, "Dance of the Good Life" (2000), he recorded a tune titled Three Mandolins, where he plays in 3 time signatures at once. This is the type of thing you can imagine Thelonious Monk doing. Nevertheless, the result (in stereo!) creates a sensation of being inside a washing machine. This effect was very hard to recreate in MIDI, partly because there is no 'mandolin' tone available. To make the MIDI file more interesting, I have added a bass line which is not included on the recording. 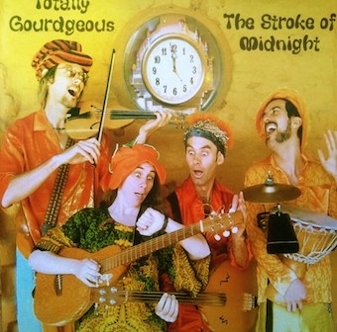 If you want to experience this trippy sensation first hand, you'll just have to buy the album." - presented at the 2006 Frances Folk Gathering (SA/VIC border) and now owned by former Frances Publican, Nigel Blake. 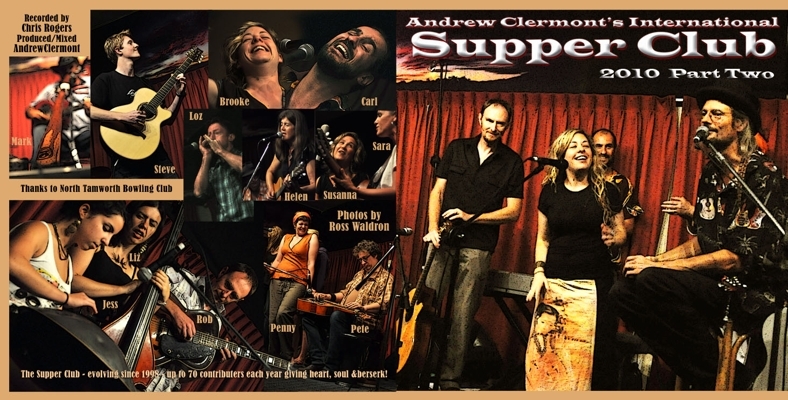 Live at the Supper Club (2003) - Plus the trilogies from 2010 & 2012!! 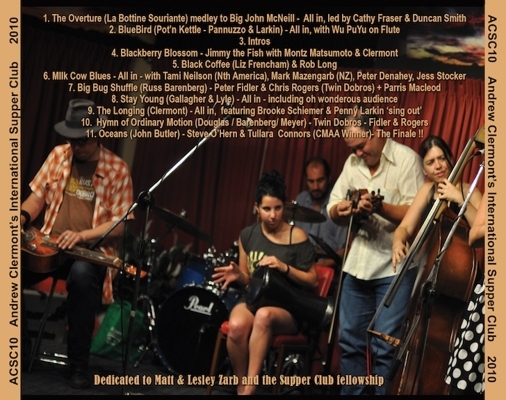 Hot, adventurous, heart stirring, complex and soaring music and harmony, melding an astonishing array of instruments and marrying Indian to Bluegrass, Samba to Curry, Irish to New Orleans, Baghdad & back to Burke 'n Beyond! 78min of our most classic mid-year concert to date. (Didgeridoo at the Athens Games), with Parris & PuYu Macleod. specifically an official, by chance, 'bootleg'!). flavours have been gathering - up to 70 through the 15 shows in the week. 700squarekm area of Tamworth, Armidale & Barraba. is fresh, bold and soars as far as we've ever managed to go. fun to hide it away. 78mins of both kinds of music - Real & UnReal! 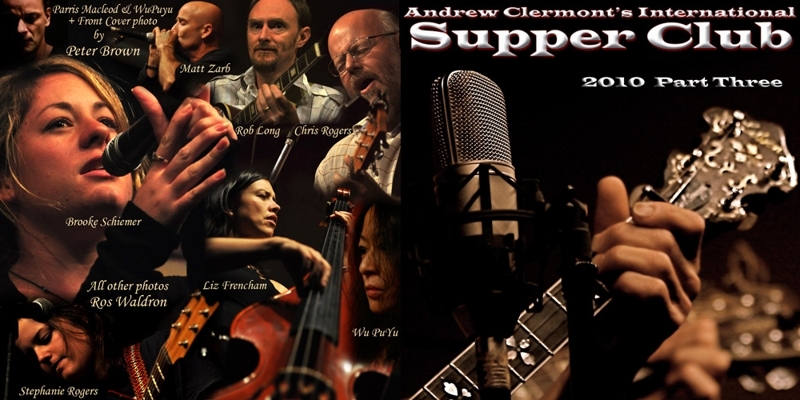 3 amazing hours distilled from 30 hrs of performance through the Tamworth Festival week for both January 2010 & 2012!! Much thanks to Chris Rogers for making the recordings possible. A rich collection spread over 6 CDs!! 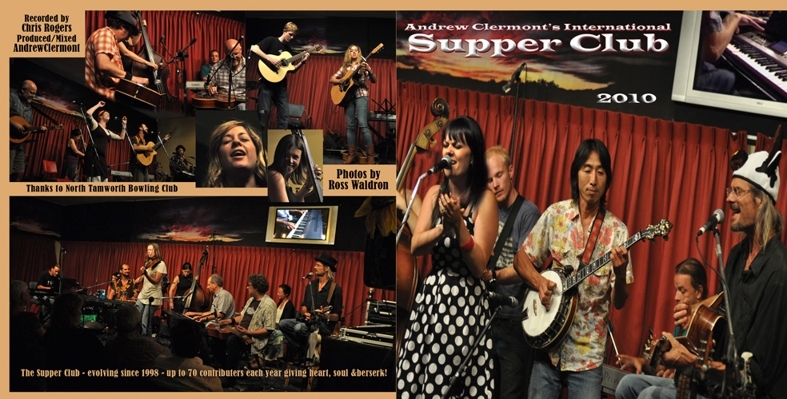 Featuring over 50 performers and memories! his brother Alex learnt Banjo & they were doing duo floorshows round Adelaide. 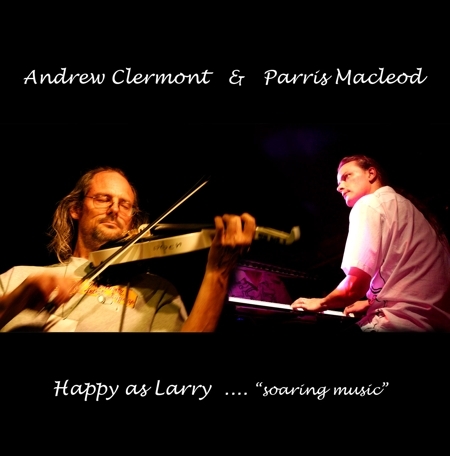 Happy As Larry is a soaring Piano & Fiddle CD with flavours of Celtic to New Age styles. The Title track was nominated to the Golden Guitar Awards 2002. The Tracks . . .
Includes Top 5 Nomination for Best Instrumental in Golden Guitar Awards 2000 (trk 6 - Reeling In The Big One) and music from "The Night of the Piano" (see Andrew's Supper Club). Copies now available. Leofoo Village Adventure Park, Hsin Shu Country, Taiwan.
. . . and the weather came close . . .
"Joni Mitchell meets James Brown in Bob Marley's Pumpkin Patch via The Muppets!!" 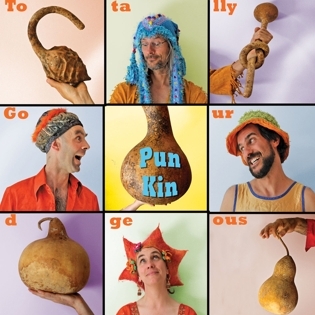 play only instruments made of Gourds! 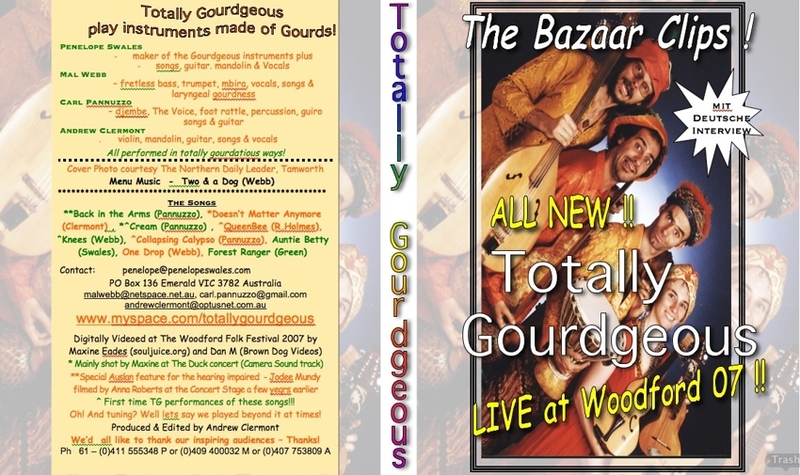 All performed in totally gourdgeous ways! Naturally! 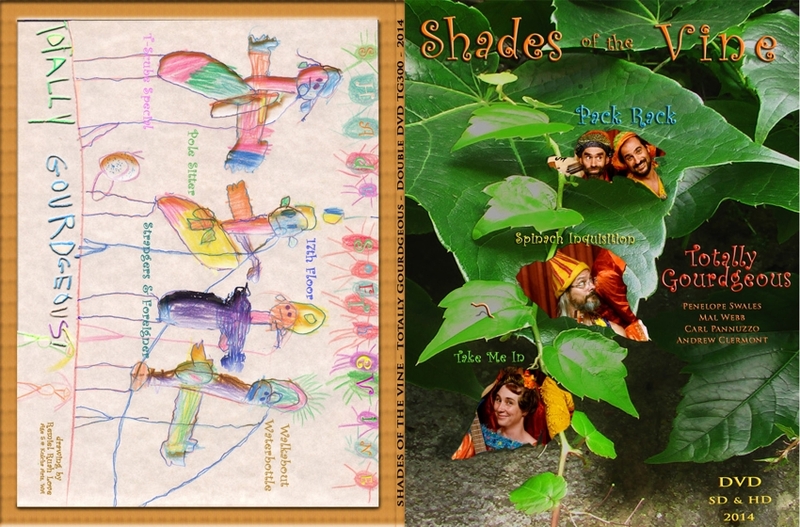 New DVD "Shades of the Vine" $30 - includes the epic "Packrack"! 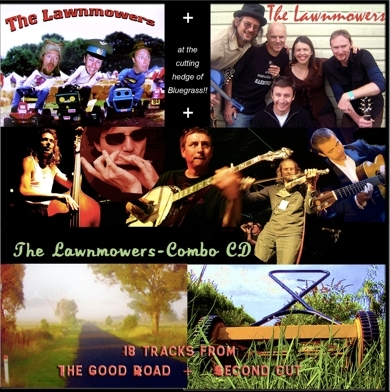 Six piece Australiana, Bush and Good Times music. 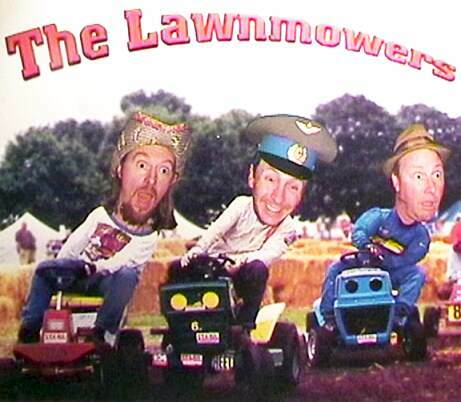 Winner of 'Battle of the Bush Bands' 1999 (as FowlHouse Jack). 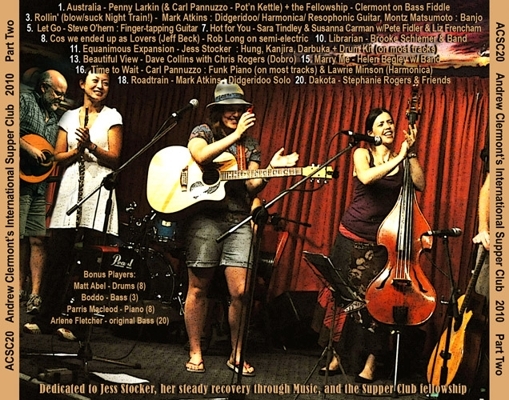 A vibrant recording, released with Southland/Outback Music. 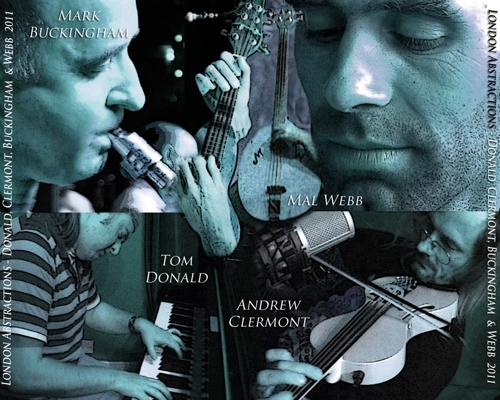 Produced, arranged, mixed and co-performed by Andrew Clermont . . . . . .
One of a series of three albums released in the early days where Andrew includes other new artists in each production. However, on this tape , Clermont plays everything with equal fervor and clean technique - a serious collectors item featuring the Bluegrass Guitar Championship as indicated below . 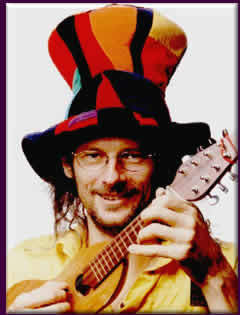 . . . .
Brian Dover on Lead Vocals, Harmonies, Songs and Acoustic Guitar (he'd like a 5-string though). Recorded live and late at Tathra Studio (Moore Creek), October 1990. 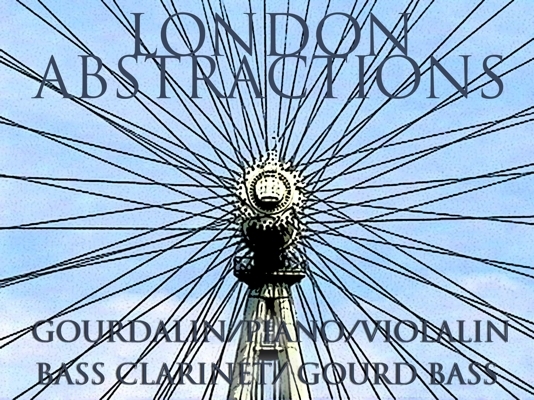 All instruments and voices recorded in stereo for stage sensoround reproduction. We put forward our best collective foot, left in laughs & jives plus a good dose of music of the moment. Craig Lauristen on Percussion & Harmonic Flute. Pretty hard to get a copy of at the mo! 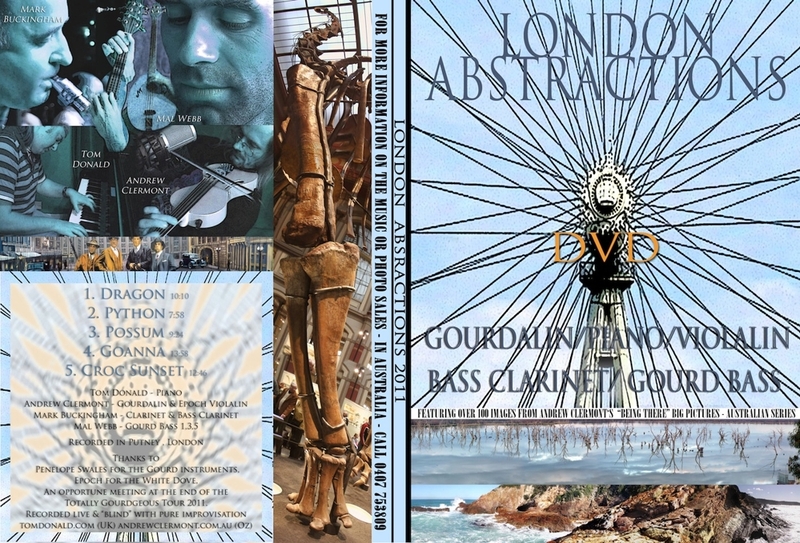 This album combines the different worlds of Australian Didgeridoo, European Strings and Afro-American influenced Percussion in a completely improvised exploration of the spirit of nature. The spontaneous flow of music takes the listener on a journey through a collection of aural landscapes, each featuring a unique combination of melody, rhythm and emotion. Each journey is separated by a solo didgeridoo interlude which acts as a narration of the following soundscape. In recent times I have taken to writing a Xmas wRap - stories and the odd detail - covering the year's mischief and wanderings. Before you is a slice across this past decade or more. A rememberance of journeys, places, people met, families extended and the music which gathered it together or set it apart. 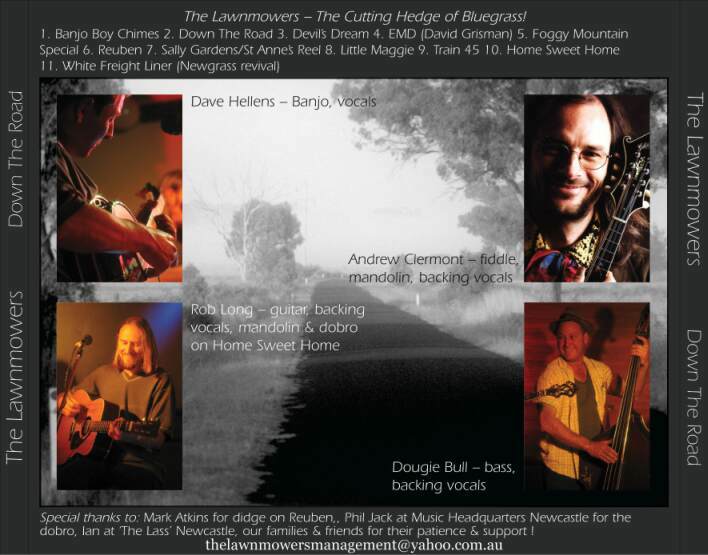 Beyond my guitar, mandolin, fiddle or vocals you'll hear "me mates" cut loose in their own style. For some it was a case of bringing the mountain to Muhammad. Two large reels of 2" 24 track tape, did the lap of Adelaide, Melbourne and Sydney twice before the contributions from friends drew to a close. Well it had to stop sometime in the two and a half years since Richard Porteous first approached me at Tamworth's Longyard Hotel. He'd said, "its time to record . . ."
– More amazing tracks from the fun team. 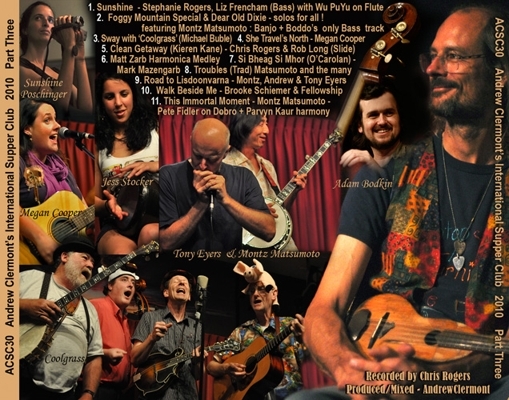 with Bluegrass to Folk - Rock - Country - a grab of Jazz - a twist o' lime! A great guide to breaking out from classical bonds! this one lesson will take you a long way. Special bonus: YOU GET TO ORDER YOUR OWN LESSON! DVDs are $50 (DidgDVD $30)- including 1st Bonus Lesson & enough steps for 5 lessons or more - great value!